Annotated pedigree of the Reeves family. Obituary from the Journal of Botany. Transcription of his obituary by F. H. Ward from the Journal of the Queckett Microscopical Club. List of Reeve's specimens held by the Scarborough Museum Trust. Link to the FENSCORE database. Little information about Walter Waters Reeves early years appears to be available. Although from a reasonably well off family they seem to have kept themselves very much to themselves. In the early 1840s Reeves was articled to the eminent surgeon William Newnham of Farnham, and whilst there seems to have developed his passion for botany, an interest which seems to have been shared by two of Mr Newnham's sons, William Orde and Christopher Atkinson. He worked in the Tunbridge area for a number of years as a Chemist and Druggist, and it is likely to be through this profession he developed an interest in photography, exhibiting twice in the 1850s. By 1861 he was living in Greenwich and working as a professional photographer and it was around this time he become interested in Microscopy, being elected a Fellow of the Royal Microscopical Society in 1864 and being appointed Assistant Secretary in 1868, a position he held for 16 years (in fact he listed this as his profession in both the 1871 and 1881 census). He was also a founder member of the Quekett Microscopical Club at it's formation in 1865. His interest in botany seems to have been rekindled in the 1870s and he collected actively from this time until his death. His Herbarium has been housed with the Scarborough Museums Trust since 1969. 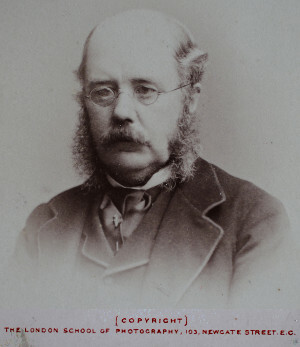 1819 February 14 : Birth Born in Beckley, Sussex, son of Thomas Walter Reeves and Mary Hosier Bristow. 1852 : Exhibition He exhibited photographs at The Royal Society of Arts exhibition which ran from 1852 December 22 to 1853 January 29. 1854 : Exhibition He exhibited at the Photographic Society's exhibition of Photographs and Daguerreotypes at the Gallery of the Society of British Artists January 4 to the End of February. 1864 : RMS Elected Fellow of the Royal Microscopical Society. "ESSEX FIELD CLUB: The Secretary reported that he had received letter from Mr. W. W. Reeves, secretary to the Royal Microscopical Society, who attended the annual fungus meeting of the club, stating that on that occasion he found singular plant of the groundsel kind near Woodford railway station. -Mr. Cole remarked that this was a very interesting "find," because the plant was mentioned by Warner as having been found many years ago, but Warner's statement had since been doubted, and now the plant had turned up in the very spot where it was found by Warner." "ESSEX FIELD CLUB. annual cryptogamic meeting. The fourth annual cryptogenic meeting or fungus foray of the above club was held in the northern section of Epping Forest on Saturday afternoon. At half-past three o'clock a large number of members and friends assembled near Holy Innocents' Church, High Beach. The following botanists acted referees and directors : -For fungi : Dr. M. C. Cooke, Dr. Spurrell, Dr. Wharton, Mr. Worthington G. Smith, and Mr. James English ; for mosses, lichens, and phauergrams[sic.] : Professor Boulger, Mr. H. Groves, Mr. D. Houston, and Mr. W. W. Reeves." "LYNDHURST:- THE CROWN HOTEL - The following have been visitors to this hotel during the week:- ... Mr. Frederick H. Ward, Mr. W. W. Reeves... "
"Deaths:- REEVES.May 18, the Vicarage, Middleton, aged 73 years. Mr. Walter Waters Reeves, M.R.M.S. --To be interred at Middleton to-morrow (Saturday), 12 o'clock"